The Thermodyne Custom Case with Wheels for the Tri-Caster TCXD300 features a factory-customized interior that completely protects NewTek's Tri-Caster TCXD300 and its accessories in transport, shipment or storage. The case is rugged yet lightweight at 21 lbs. It's equipped with rolling wheels and a retractable handle. A replaceable gasket is integrated into the inner lip and keeps out dust, dirt and moisture. A locking hasp accepts standard padlocks or TSA locks. The handle and latches are spring-loaded; upon being released, they spring back down and level off flush with the case so as not to stick out and accidentally be knocked off. 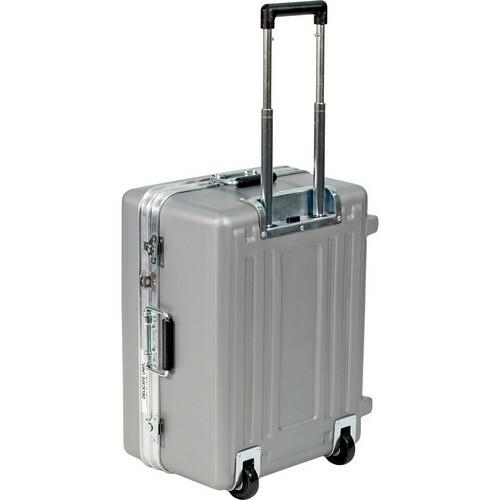 Box Dimensions (LxWxH) 24.2 x 18.6 x 14.4"
Custom Case with Wheels for the Tri-Caster TCXD300 is rated 4.0 out of 5 by 1. Rated 4 out of 5 by Danto2 from Case for Tricaster 40 v 2 I was anxious to get this case because we lug our Tricaster to different venues for our streaming coverage of college games. The case is great, very sturdy and the Tricaster base fits in it very well with just a little room for the power cord. I was disappointed the keyboard and mouse do not fit, but I may try to cut out the foam around the base to make a place for them. It makes a great table for the Tricaster once we are at the sports complex. I am an average sized woman and can easily roll this (very much like a piece of luggage) and carry it down a flight of stairs. There are handles for carrying either vertically or horizontally. All in all, I am pleased and think this will protect our investment for many years.